Chicory is a popular salad green in Europe, but doesn’t get enough love in the United States. The darker green leaves are slightly bitter and peppery, while the pale inner leaves are milder in flavor similar to frisée. 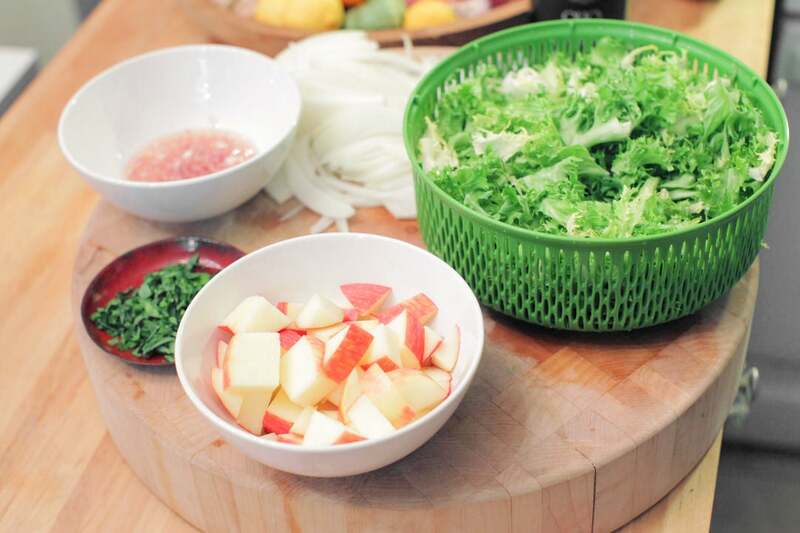 Combining chicory with sweeter ingredients, like apples and caramelized onions, gives this salad a great balance. Wash and dry the fresh produce. Finely chop the tarragon leaves. Cut the chicory into bite-sized pieces. Core and medium dice the apple. Peel and slice the onion. Peel and mince the shallot to get about 2 tablespoons of minced shallot. Place the minced shallot in a small bowl, along with the sherry vinegar. 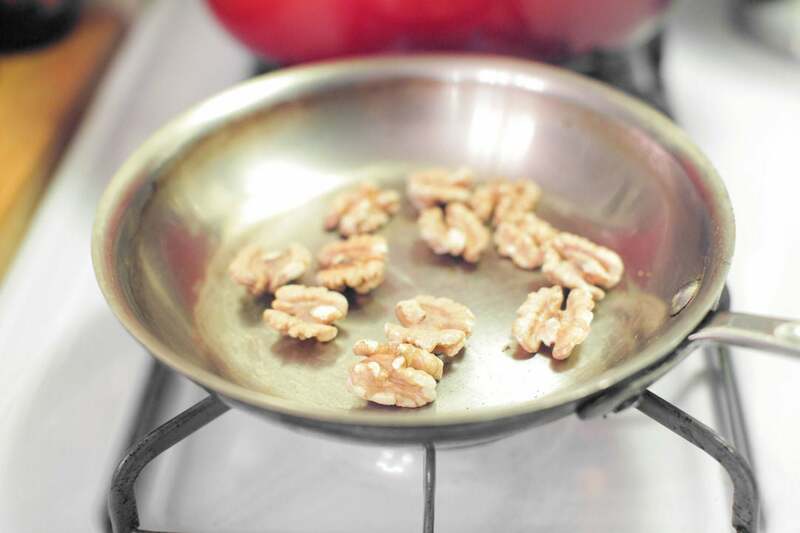 Add the walnuts to a medium dry pan and cook on high for 2 to 3 minutes, or until fragrant and toasted, stirring occasionally. (Be careful, as they can burn quickly.) Transfer the toasted walnuts to a small bowl. Wipe out the pan used to toast the walnuts. Heat a little olive oil on high until hot. Season the flank steak with salt and pepper, then add it to the hot pan. Cook 3 to 4 minutes per side for medium-rare, or until it reaches your desired doneness. 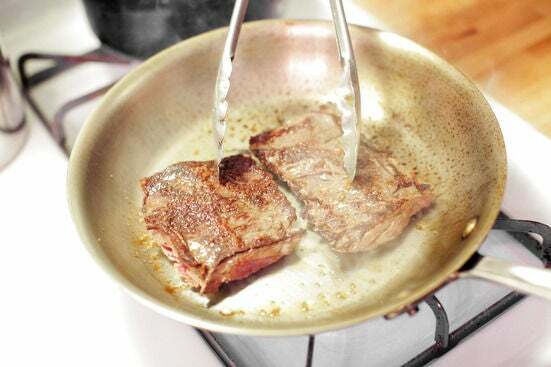 Transfer the steak to a cutting board to rest, leaving any juices behind in the pan. Add the onion to the pan used for the steak and season with salt and pepper. Reduce the heat to medium and cook 8 to 10 minutes, or until the onions are golden brown and caramelized, stirring occasionally. Add the chickpeas, turmeric, and curry powder and cook 1 to 2 minutes, or until the chickpeas are warmed through, stirring to coat them in the spices. 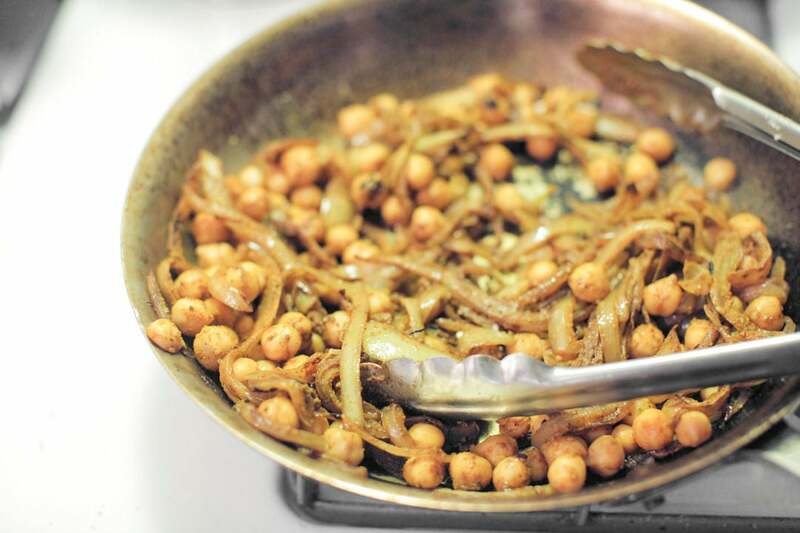 While the onions cook, make the vinaigrette. Add the tarragon to the shallot-vinegar mixture. 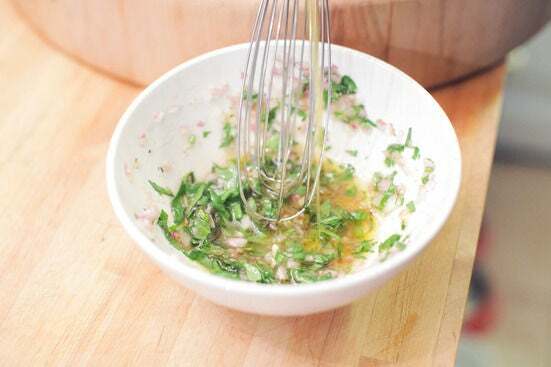 Slowly whisk in about 2 tablespoons of olive oil to make a vinaigrette. Season with salt and pepper to taste. 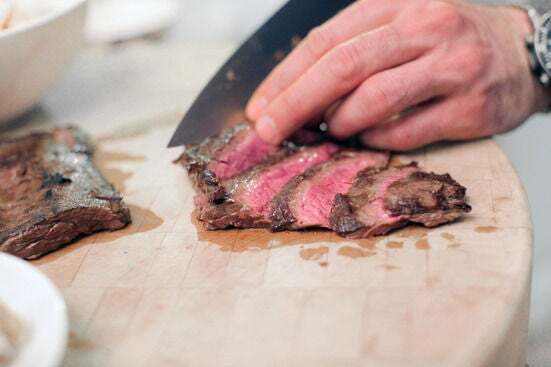 Find the lines of muscle in the steak, or the grain. Thinly slice the steak crosswise against the grain. 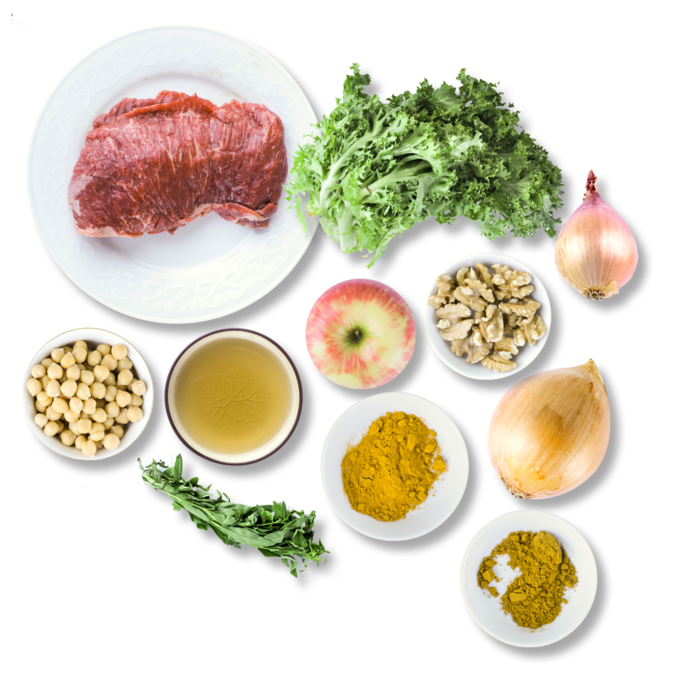 In a large bowl, combine the apple, toasted walnuts, chicory, curried chickpeas, and some of the vinaigrette. (You may have extra vinaigrette.) Toss to coat and season with salt and pepper to taste. 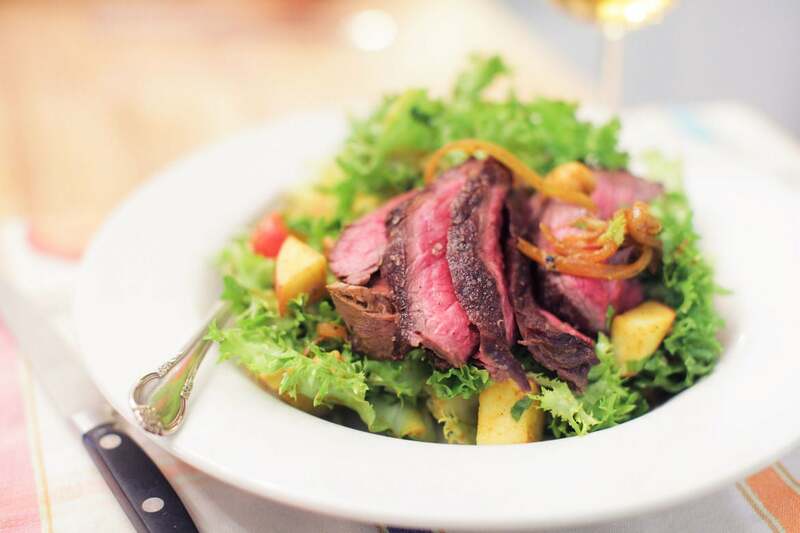 Divide the salad between 2 plates and place half the sliced steak on top of each plate of salad. Enjoy!